Life: The good, the bad and the ugly bits! My last baby is starting school and I’m okay with that. Last week my youngest child, who only turned three in July, started full time in our local Welsh language primary school. My two boys. One's just starting his school journey and the other is in his last year in primary. I wish time would slow down just a little! This might sound unusual to those of you who are currently sending your four and five year olds off to school for the first time. But in our area, all children start full time in the nursery class of their local primary school the September after they turn three. I have no idea why, that’s just the way it has always been. At least it the 13 years since I’ve had school aged kids. O is the fifth child I’ve sent to this school. 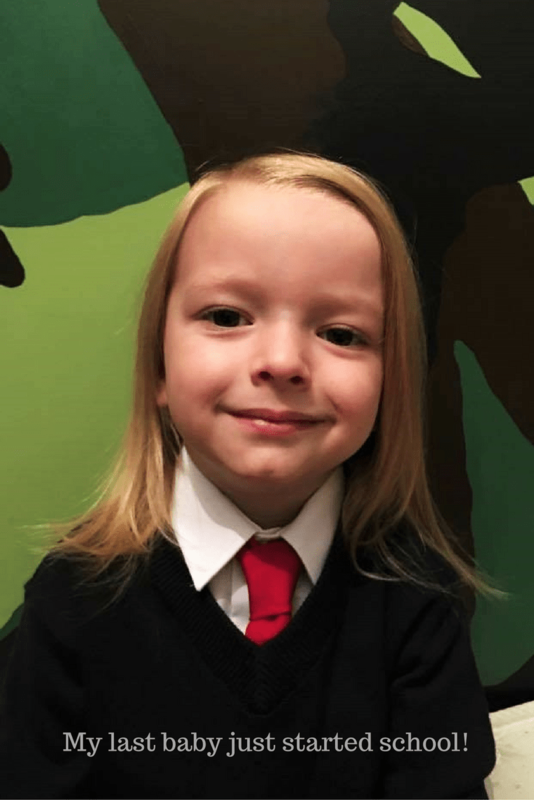 The three girls are now pupils in the county’s only Welsh language comprehensive school and LV will be leaving his little brother to join them next September. But this time around marks the end of an era for me. This is the very last time I will have a child starting school. Of course I thought that with LV, before we decided to have one more, but this is definitely it for sure this time. There’ll be no more babies in this house! I thought I might have had a bit of a wobble on that first Monday morning and I did feel a bit lost for the first day, but I’ve mostly been quite indifferent to it. I feel a bit guilty that I’m not bothered by it at all. But maybe I’m so at ease because it’s all gone smoothly and he’s taken to it so well. He went in at 9am with barely a glance goodbye. Was more than happy to drink his ‘special milk’ (almond milk) from a cup when everybody else had a bottle of ‘cow milk’, managed to stay awake the whole afternoon and came out at 3.30pm perfectly happy to go back again the next day. He was even disappointed that he wasn’t going on Saturday! So this is now our normal. I can actually do things around the house without having to entertain a small child, stay at the allotment even if it’s raining, pop to the shops without buying snacks to keep said small child from moaning, pee alone, drink hot drinks…while they’re still hot. But perhaps most importantly I now need to decide what I want to be now I’m a grown up! Do I want to go back and work in a preschool setting? I can and will if needs be. But ideally I will be able to make money at home by writing. I have a few ideas that have been on the back burner for a while and now is the time to set some wheels in motion. I was asked a little while ago whether I felt guilty about him being in school so young and did I wish he could stay home for another year. And in all honesty? not on your life! Yes I feel like time is flying by at a lightening pace, but the school my kids go to is lovely, the foundation phase means he gets to spend all day playing, learning without even realising it all the while being immersed in a Welsh language environment. I couldn’t ask for a better start to his educational journey! Do you have a little one starting school this year? How are you feeling about it?